So what would you say if a pleasant young guy, with brilliant blue eyes and a rich, deep voice asked you if he could create an entryway for you? Uh, YES! I didn’t realize it at the time, but Jared really did mean, create it for us. He had his vision, and we trusted him completely to create something just-right. And, wow, did he! We closed the doors on Sunday evening of our February 2013 Tag Sale, and amidst ferocious wind, rain, sleet, and snow, Jared and his Oldetowne team created a spectacular patio in one short month. All of the stone and brick in the walls was salvaged from Frederick County. 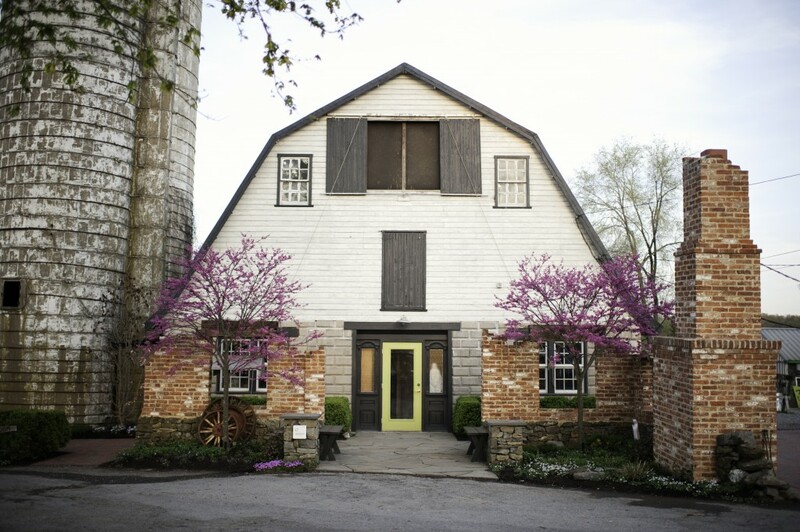 It’s all from fallen buildings – a fate we have saved our precious barns from. I’m so happy to have some part of those farm buildings which haven’t made it. In addition to salvaging the bricks and stone for the walls of the ‘ruin’, Jared, every bit the scavenger that we all are, searched about our property, and noticed some pieces of wood that he wanted to incorporate into his design. The fireplace mantel and the ‘window’ transoms are all from wood found here on the farm. Jared torched the pieces, giving them the look of having survived the catastrophic fire which clearly felled the rest of the building. 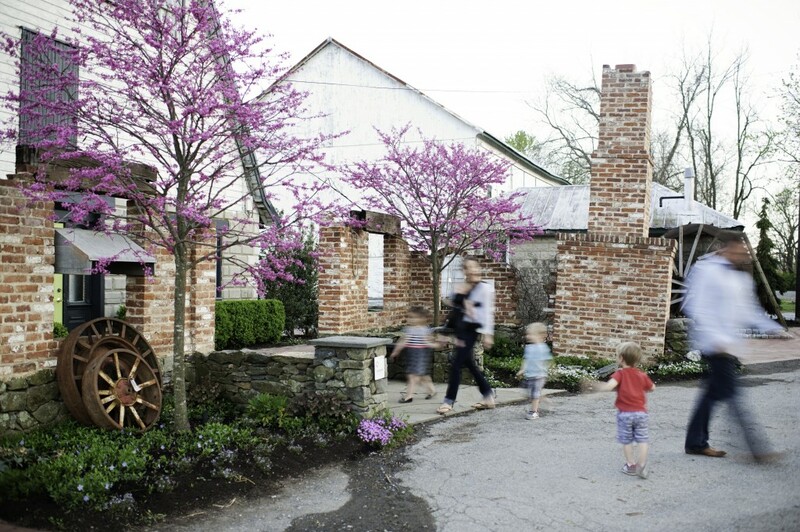 The story of the creation of our patio is not complete without a bit of personal context. Since Christmas of the previous year, Chip had not been feeling well. He finally got into the doctor in February. After a battery of tests, we learned that he had Stage IV Colo-rectal cancer. Any of you who have ever received news like that about a loved one understand how devastating that diagnosis was. The evening after we got that terrible news, the fireplace, which is a story all it’s own, was completed and ready for use. The crew had actually made an impressive fire in it earlier that day. Feeling extraordinarily melancholy and quiet, we took a couple of chairs down to the fireplace, lit a fire, and warmed ourselves on the cold day, and just appreciated every gift we had received throughout our lives. And drew hope and strength from each other, and the warm and beautiful gift Jared had just given us. That’s Chip, who’s now cancer-free, walking with our daughter, Katherine, through the then-newly created patio space. This impressive engineering feat was fascinating to watch being created. 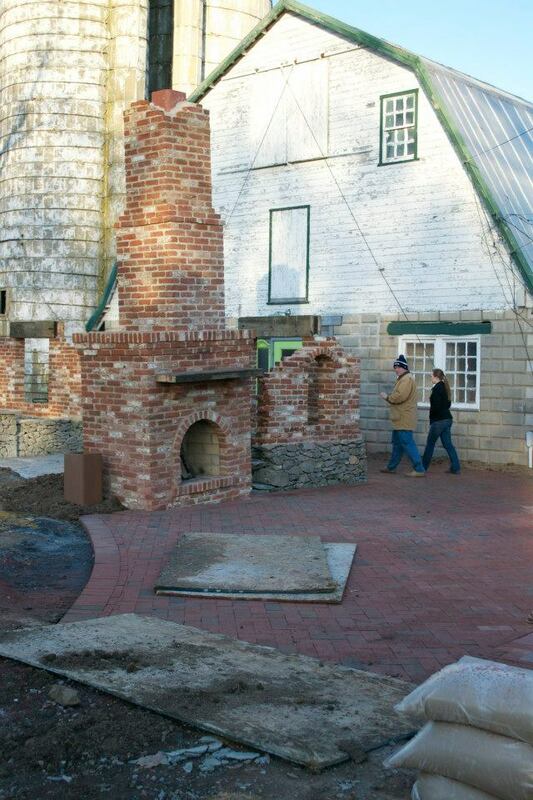 Jared’s team, working in a typically frigid Maryland February, built a tent around the space where this prominent feature was to go, heating it as best they could, as the mortar needed to be above freezing. This construction went on for about a week. 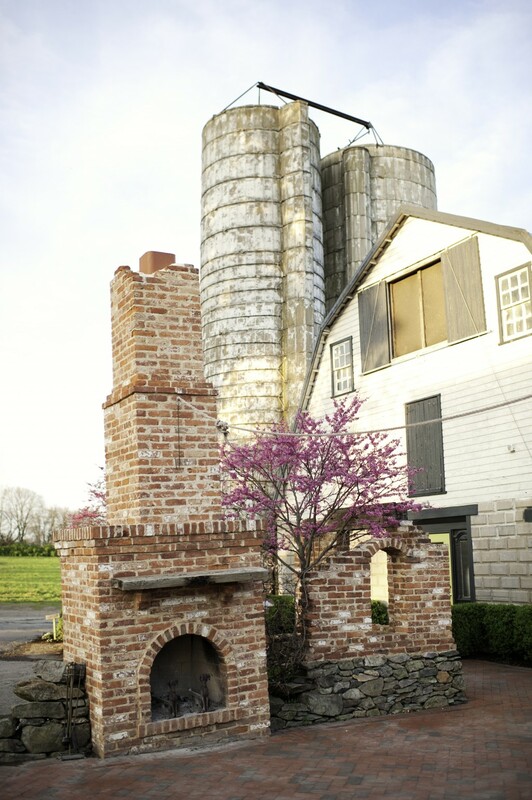 When the perfect fireplace and chimney had been completed, built upon 3 hydraulic lifts, the lifts were used to lower one side ever-so-slightly, giving the fireplace the crooked, ruin appearance it now has. 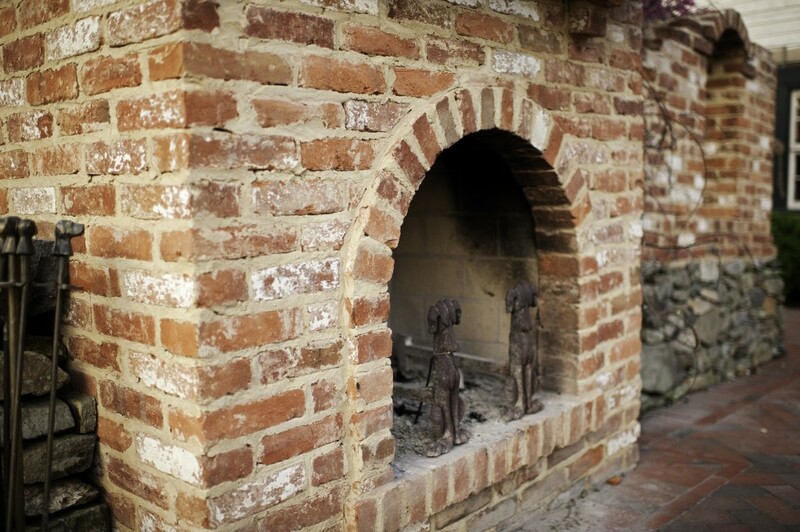 Another favorite of this patio area is the dog-themed fire set. The andirons and the labrador-headed fireplace tools are favorites of mine, too – no, they are not for sale. Those of you who have been coming here since the beginning will remember our cherished black lab, Tar. She died in 2012, and we’ve not had a dog since. These fireplace tools make me think of her every time I see them. As they finished up the patio walk ways, the entrance was fitted with large, beautiful sections of bluestone. Shortly before we were to open for our March event, I noticed that all the pavers were neatly in place, but there was a large section missing, right at the front door. I thought, “Oh, how sad that such a big piece broke.” Not realizing that they had intentionally left the space blank as they waited for the piece de resistence to arrive: a custom-cut stone with “Chartreuse” carved into it. Jared hadn’t told me anything about it, and when I saw it, I nearly cried. It was just perfect. And I couldn’t believe what a thoughtful, perfect touch it was. The man himself. Jared Herman, in his element. Jared was hands-on throughout the process. Here he’s bravely (did I mention it was bitterly cold the whole time?) 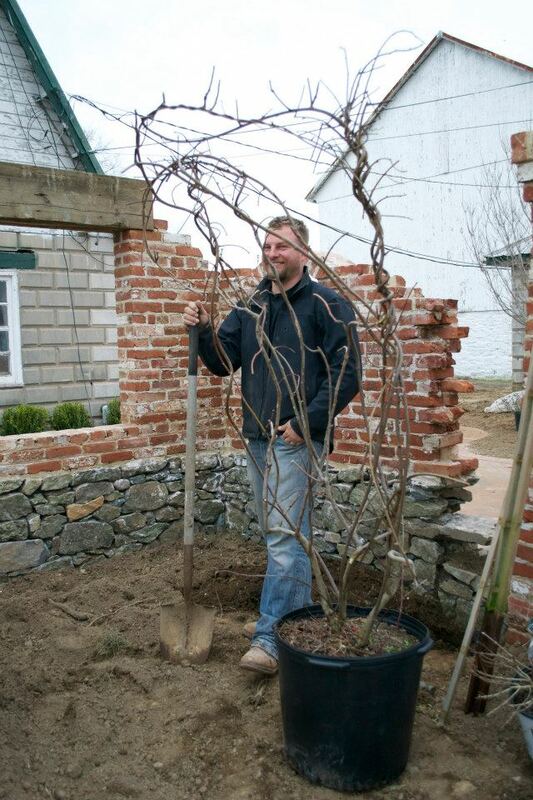 planting the wisteria that grows up between the ‘broken wall’ and the fireplace. The illusion is that the vine created the break, pushing the fireplace to the angle you see today. In truth, it was conceived that way. Jared’s vision was of a ruin – a farm building that had not made it, juxtaposed against those which had. Photography of the completed patio is by Magnolia Street Photography. Our completed patio enhances not just the area in front of the main barn, but the entire property. 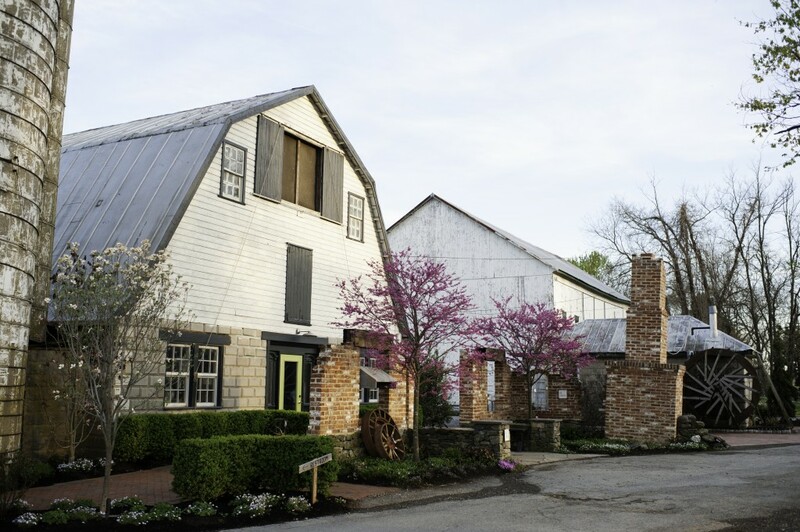 It focuses the visitor’s attention on the farm buildings, integrating them, and harkens to the fate of so many other farm buildings in Frederick County. 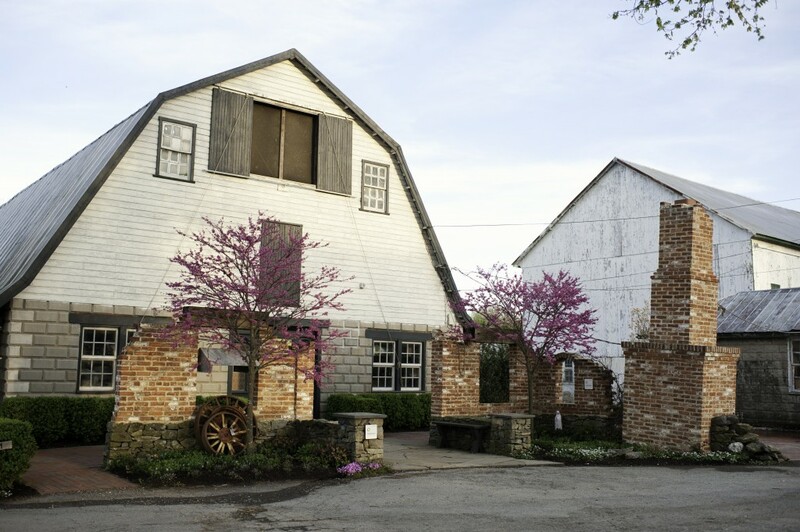 Jared created a tribute to our precious, and increasingly rare, farm structures. Come visit us and experience the wonders of a well-conceived outdoor space. We’re open March 17-19. And if you want to see even more Frederick area gardens, mark you calendar for Beyond the Garden Gates tour of some of downtown Frederick’s most exceptional private gardens . The list of gardens and tickets will be available beginning April 1. We’ll be selling them here at Chartreuse & co during our April and May openings. You are a beautiful writer Virginia. Thank you for sharing your stories. I always enjoyed my visits to your farm and I miss that area. Thanks, Victoria! It’s easy to write when you’ve got such great inspiration for it! Thank you, Viringia & the chartreuse Family for all that you do to make my experiences at the barn extra special. Love love love it! Fran would be so proud of you all. Thanks, Judy. I still miss her every day. Thanks, Joyce. Glad you enjoyed the story; there are few things as precious as a beloved pet. I have been coming here for awhile now and love it and always find a treasure or three…but I love this story explaining the how and why of your beautiful patio and fireplace. Thanks, Renee! I hope you’ll enjoy it all the more, knowing this story. I had no idea that’s how the beautiful patio came to be . Beautiful story, Virginia ? Thanks, Michele. It was such a great experience, I wanted to share it! As I am reading your post , memories flash through my mind . My cherished time at early tag sales before the barns ! Our Talks about the sisters of visitation , apple dumpling day ! All the while the girls Tar and chip working with you in support of your dreams and visions for your family . Fueled from your passion to see beauty in all things , you and your families dreams have come true . So many blessings each earned . I am still humbled that you share these dreams and passion for the things you love every month ! Please know you have not only brought your passions and love for design to The citizens of Frederick county and beyond , you have also created a space to fuel the authentic artistry of your vendors ! The quality you chose to share the chartreuse name and space with is evident at every sale . For that I am grateful patron . For sticking with your dreams and visions for chartreuse I am a loyal patron . For taking the time to create memories with me that I have cherished for the years since I left the business I am a grateful friend . Namaste Tracey B. Thanks, Tracey, for your kind and generous words. It’s been such a blessing to us and, hopefully, to all those who visit. Don’t you just admire the artists eye that can conceive and carry out this vision? Although I’ve visited your sales, I have never realized that this patio area is a newish creation…it looks so comfortable in its locale I assumed it had been part of the original that had fallen on hard times. Jared can come create for me anytime! It was totally his vision – start to finish. His vision is so sensitive to our iconic buildings that it’s hard to imagine it without them now. Thanks, Wilda! Jared is a gifted artist and we are blessed to have one of his canvases! 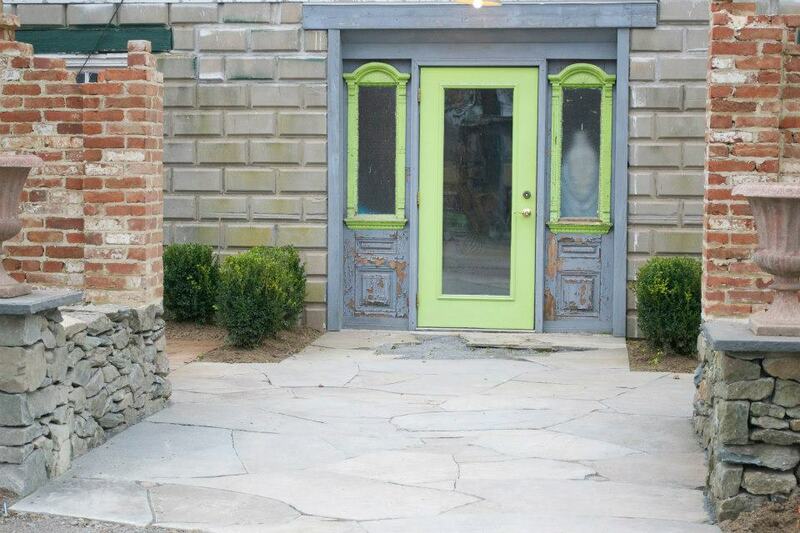 What an amazing idea for your barn entrance..I love coming to your property and can’t wait to see it in person. Job well done!!! Thanks, Sandra! I hope you can enjoy it in person soon! What a great addition to your already-marvelous property! We accept temporary dealers here twice a year during our Market Days in April and September. We’re full for April, but the application is online for September. Just click the About Us tab, and look for the Market Days Application/Information. 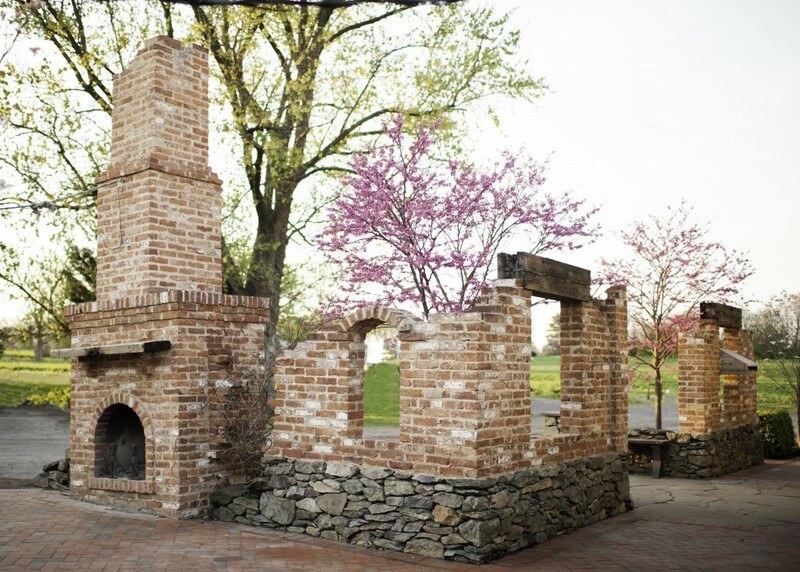 Beautiful story about how the patio and fireplace came into existence. I especially loved reading your personal story about Chip…I can envision you sitting in front of the fireplace and taking in the news that he’d received. So glad to hear that he’s cancer-free! Thanks so much, Lisa. The patio was such a wonderful gift during such a difficult time. And now, both Chip and the patio are here with us!